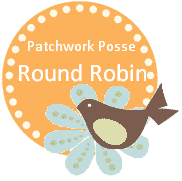 Blog hopping over the weekend and found your round of the Row Robin. LOVE. At first sight! I need to do the applique now so I can put your "row" on. Stash busting some of the favorite fabric colors I seem to have been hanging onto forever.